How Much Time Does It Really Take to Care for a Dog? Q. I’m a cat person. My girlfriend is a dog person. We have a cat. She wants a dog. But I think they need a lot more time than she remembers from her pet as a child. What level of commitment are we looking at, if I agree? A. Some dogs, like some people, are high maintenance — they need lots and lots of attention. Sometimes that attention is in caring for a complicated coat, but usually the demand comes in a category many Americans don't have time for already — exercise. All dogs need exercise. Even little ones. Even old ones. Even ones who really don't seem to mind a sedentary lifestyle. Exercise — or lack of, more specifically — is also one of the main reasons dogs "misbehave." They need to burn energy, and if you don't find something for them to do, they'll find something to do on their own, and chances are you won't like their choices of activities. A lot of young dogs end up in shelters because they really just need more exercise and aren’t getting it, which makes them too much for their owners to handle. The least amount of time you can "get away with" is probably an average of an hour a day, all told, for feeding and cleaning up after your dog, and for that all-important exercise. For dogs with high levels of energy (what many people call “hyper”), double that. Though I recommend most dogs get at least a solid half-hour of heart-pumping aerobic exercise every day, that recommendation becomes a mandate when you’re talking about dogs such as Jack Russell Terriers, Border Collies and many mixes of terrier, hunting or herding dogs. The amount of exercise needed isn’t always linked to a dog’s size: Retired racing Greyhounds, for example, have exercise requirements that are so easily met that adoption groups call them “40 mph couch potatoes." And though a Pug and a Westie are both small dogs, the Westie is a very active dog, while the Pug is pretty sedate. Though you might remain dog free if left to your own devices, you may be surprised how much you like and benefit from having a dog in your life — including a likely increase in exercise for you and your girlfriend. 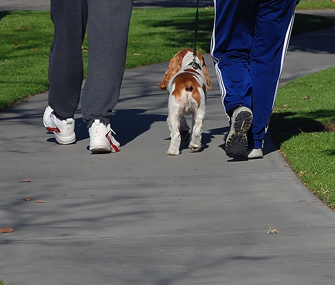 Studies show that dog owners tend to be more active than people without dogs, and since most people don't get enough exercise, either, that just can't be a bad thing. If you and your girlfriend agree to get a dog, I’d recommend working with a good shelter or rescue group and being patient and open-minded about the matches suggested for you. Your best bet will likely be a middle-aged or older dog who’s friendly, easy-going and relatively calm and easy to care for — and who gets along with cats, of course, and matches your lives in other ways.